What Are Swimming Training Zones? Training zones help organize a swim workout into different intensities! Training zones help organize a swim workout into different intensities. In a structured workout group, the coach will explain to their swimmers at what intensity each set is to be performed. 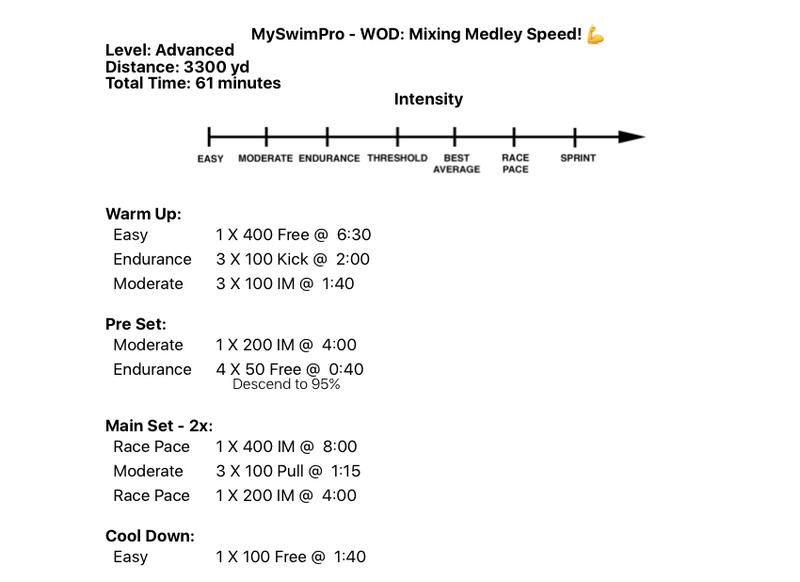 In the MySwimPro application, every workout has a different zone assigned to each set that are also color-coded (more on that later). USA Swimming previously used seven energy zones or categories. These include Recovery (Rec), Endurance 1 (EN1), Endurance 2 (EN2), Endurance 3 (EN3), Sprint 1 (SP1), Sprint 2 (SP2), and Sprint 3 (SP3). Coach Jon Urbanchek of the University of Michigan suggested color-coding each energy category for ease of understanding. We’ve simplified this experience defining each of the 7 zones with a specific color and naming convention listed below. 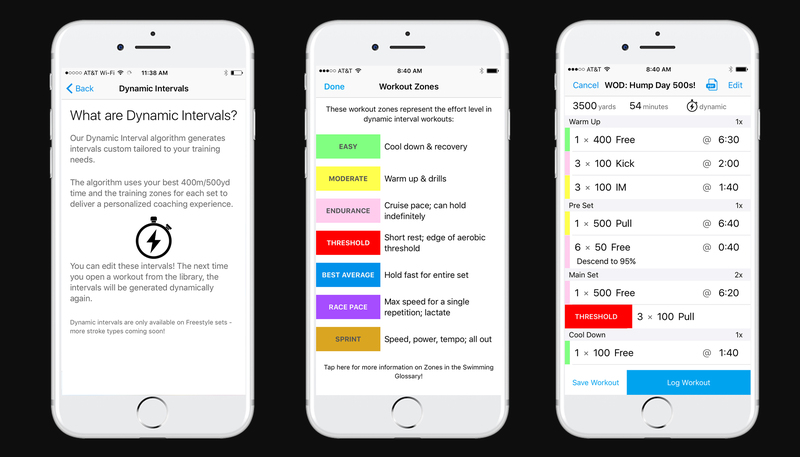 In addition to personalizing every workout in the app by dynamically generating intervals on every set, we’ve also added a label to help you understand just how hard to push yourself on each part of the workout. 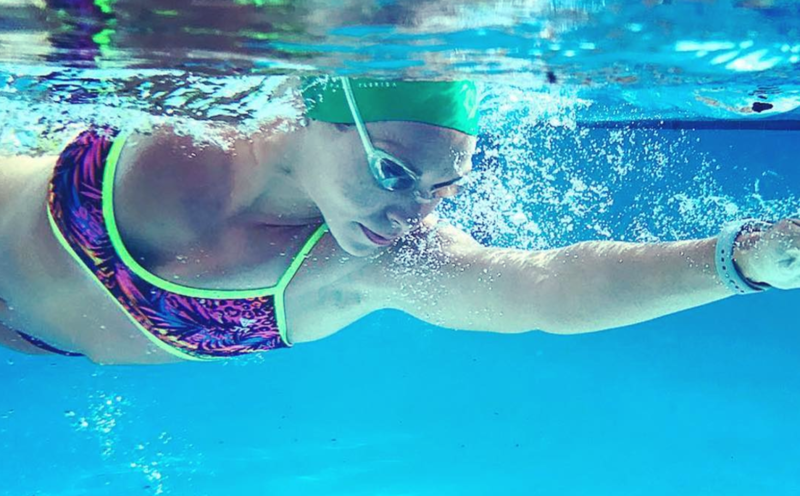 The importance of training zones in swimming is based on the existence of several different pathways to recycle energy in the muscle cells during exercise. The main pathways of energy recycling are non-aerobic metabolism (creatine phosphate), anaerobic metabolism (anaerobic glycolysis), and aerobic metabolism. Metabolism is the process of storing and releasing the energy. Energy for the body is stored in different forms and pathways are used to convert these forms into accessible energy that an athlete can use to perform work. There are no “borders” to energy pathways in a body. At any given time, several pathways, not just one, may be engaged in energy production, but dominance of an energy source depends on the duration and intensity of the exercise. Usually workload is broken into several energy “zones” based on the duration and intensity of the training. Energy “zones” allow athletes and coaches to develop a specific pathway of energy recycling and to quantify, track, and plan the physiological adaptations desired for their specific event. Swimming sets of different duration and intensity are supported by energy from different sources. During high intensity short-term swimming bouts most energy is recycled through the anaerobic pathway. It is a fast and non-oxidative way of energy recycling. During low intensity long-term swimming bouts, the energy is recycled mostly aerobically using oxygen. This way is slow, but more efficient than the anaerobic way. Improvement of one energy system does not influence another one. When athletes swim long distances, they develop mostly aerobic energy sources. High intensity swimming develops the anaerobic energy sources. Different swimming events require the training of different energy pathways. The same swimming set can be swum in different energy zones. For example, swimmers can swim sets with higher or lower intensities. This will recruit different pathways of energy recycling. The same swimming intensity or even heart rate affects the energy recycling pathways differently when athletes are at different stages of the season (i.e., in the beginning of the season, after a sickness, or at peak performances). Adaptation in athletes to the same swimming intensity depends on their current condition, types of muscle fibers, training history, and other factors. Therefore, it is important to test athletes during a season and to select appropriate swimming intensities (by using heart rate) to train different energy zones. Metabolism of Creatine Phosphate is the process of recycling ATP from CP. CP is stored in muscle cells. It very rapidly recycles ATP from ADP. Usually after 2-3 seconds of high intensity work, free ATP stores in muscle cells are depleted. Then CP phosphate is involved to recycle ATP. After 10-15 seconds of high intensity work the rate of recycling ATP from CP is slowed down. Creatine Phosphate has very high power, low capacity, and low efficiency. Examples of swimming sets and distances to develop creatine phosphate metabolism: diving and turns, short distances (10-25 M/Y) with maximum intensity, swimming sets with short distance and long rest interval (i.e., 4-6 x 12.5 M/Y, 2-4 x 25 M/Y with rest interval 1-3 min.). Anaerobic Metabolism (Anaerobic-Glycolitic) is the non-oxidative process of recycling of ATP from glycogen. Glycogen is stored in the muscle cells. Glycogen fairly rapidly recycles ATP, but it is slower than from CP. Anaerobic metabolism produces lactate. It is the main energy system for exercise bouts of 30 sec until 3 min. When distances are longer, aerobic metabolism predominates. Anaerobic metabolism has high power, middle capacity, and low efficiency. Examples of swimming sets and distances that develop anaerobic metabolism: distances of 50 to 300 M/Y, high intensity swimming sets with a short rest interval (i.e., 6-16 x 25 M/Y, 4-8 x 50 M/Y, 2-4 x 100 M/Y, 2 x 200 M/Y with rest interval 20-30 sec etc.). Aerobic Metabolism is the oxidative process of recycling ATP primarily from glycogen. It is a slow process of recycling ATP. Glycogen for aerobic metabolism is stored in muscle, liver, and blood. Fats and proteins can be involved in aerobic metabolism also, but this process is very slow (long distance swimming). Aerobic metabolism is the main energy system for distances longer than 4 min. The longer distance, the more energy derived from aerobic metabolism. Aerobic metabolism takes place in a small intracellular organelle called mitochondria. Aerobic metabolism has low power, high capacity, and high efficiency. All energy zones are relative. There are no borders between energy zones. However, each zone has a primary pathway for energy recycling. Understanding energy zones is helpful in classifying swimming sets and developing particular pathways for energy recycling. 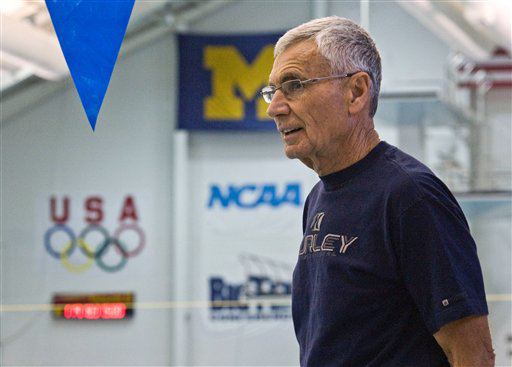 This information was compiled by consulting dozens of internationally recognized coaches including information from USA Swimming’s online resources including work published by Genadijus Sokolovas, Ph.D., Director of Physiology at USA Swimming. I am 61 years old and was a National swimmer in college in India. After reading your blog I am tempted , in fact I would love to swim in the next Masters. Could you please advise me how best I can train given that I have 2 years to go before the next meet. Racing in a swim meet is a great goal to keep you focused knowing that there’s a specific event approaching. Two years is a relatively long-term goal with regard to competition, so I recommend breaking up your training plan to include several shorter-term goals that are achievable. These goals don’t have to be race-based, they could have to do with your training schedule. For example you could set a goal for the number of workouts per week or month you will do, or the distance of these workouts.